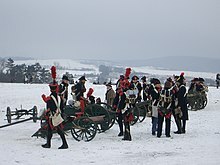 In military organizations, an artillery battery is a unit of artillery, mortars, rocket artillery, multiple rocket launchers, surface to surface missiles, ballistic missiles, cruise missiles etc., so grouped to facilitate better battlefield communication and command and control, as well as to provide dispersion for its constituent gunnery crews and their systems. The term is also used in a naval context to describe groups of guns on warships. Artillery battery origins from a Grand Duchy of Lithuania bajoras and artillery expert Kazimieras Simonavičius' book Artis Magnae Artilleriae (Lithuanian: Didysis artilerijos menas, English: The Great Art of Artillery) published in 1650, which contains a large chapter on caliber, construction, production and properties of rockets (for military and civil purposes), including multistage rockets, batteries of rockets, and rockets with delta wing stabilizers. The number of guns, howitzers, mortars or launchers in an organizational battery has also varied, with the calibre of guns usually being an important consideration. In the 19th century four to 12 guns was usual as the optimum number to maneuver into the gun line. By the late 19th century the mountain artillery battery was divided into a gun line and an ammunition line. The gun line consisted of six guns (five mules to a gun) and 12 ammunition mules. "Battery" is a relatively modern term at sea. Advanced warships in the Age of Sail, such as the ship of the line, mounted dozens of similar cannons grouped in broadsides, sometimes spread over several decks. This remained the standard main weapon layout for centuries, until the mid-19th century evolution of the naval rifle and revolving gun turrets came to displace fixed cannon. The first operational use of a rotating turret was on the American ironclad USS Monitor, designed during the American Civil War by John Ericsson. Open barbettes were also used to house their main batteries on rotating mounts. Both designs allowed naval engineers to dramatically reduce the number of guns present in the battery, by giving a handful of guns the ability to concentrate on either side of the ship. In time this trend reversed, with a proliferation of weapons of multiple calibers being arranged somewhat haphazardly about a vessel, many in mounts on the hull or superstructure with limited travel. Confusion also arose when combinations of large caliber "main battery" and smaller "secondary battery" weapons of mixed offensive and defensive use were deployed. This began to be resolved with the 1906 launching of the revolutionary "all big gun" battleship HMS Dreadnought. It shipped a main battery of ten heavy caliber guns, and a smaller secondary battery for self-defense. This leap in heavy offensive armament from a standard four large caliber guns to a main battery of ten made all other battleships obsolete overnight, as the weight of broadside it could unleash, and overwhelming rate of fire a superior number of similar weapons could sustain, could overwhelm any similarly sized warship. Cut-away illustration of a triple 16"/50 caliber Mark 7 gun turret. Three of these formed the main battery of Iowa-class battleships. A third, or tertiary battery, of weapons lighter than the secondary battery was typically mounted. 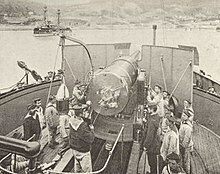 To simplify the design many later ships used dual-purpose guns to combine the functions of the secondary battery and the heavier guns of the tertiary batteries. Many dual-purpose guns also served in an anti-aircraft role. In addition, dedicated light-caliber rapid-fire anti-aircraft weapons were deployed, often in the scores. An example of this combination was the German battleship Bismarck, which carried a main battery of eight 380 mm (15 in) guns, a secondary battery of twelve 150 mm (5.9 in) guns for defense against destroyers and torpedo boats, as well as a tertiary battery of various anti-aircraft guns ranging in caliber from 105-to-20 mm (4.13-to-0.79 in). Conventional artillery as a vessel's battery has been largely displaced by guided missiles for both offensive and defensive actions. Small caliber guns are retained for niche roles, such as the multi-barrel Phalanx CIWS rotary cannon used for point defense. The rapid fire 5"/54 caliber Mark 45 gun 5-inch (130 mm) and Otobreda 76 mm (3.0 in) used for close defense against surface combatants and shore bombardment are among the last traditional naval guns still in use. Various more specialized types, such as anti-aircraft, missile, or Multiple Launch Rocket System batteries. ^ Balčiūnienė, Irma. "VIENO EKSPONATO PARODA: KNYGA "DIDYSIS ARTILERIJOS MENAS"!". www.etnokosmomuziejus.lt (in Lithuanian). Lithuanian Museum of Ethnocosmology. Retrieved 5 February 2018. ^ Bethell 1911, p. 263. Bethell, Henry Arthur (1911). Modern Artillery in the Field: A Description of the Artillery of the Field Army, and the Principles and Methods of Its Employment. London: Macmillan.